Last Thursday, we declared the corner of Eighth Avenue and 43rd Street had been scrubbed clean of all the Playpen players that ran rampant there back in the 80's. But the very next day we had to eat our words after the NYC Vice Squad padlocked the all night lingerie emporium at 687 Eighth, better known as Gotham City. Above the gleaming security chain a fluorescent orange Restraining Order was affixed to the entry door. Where the fun palace used to proclaim "Live Girls Girls Girls", it's now written that the joint has been shuttered due to "Prostitution." The notice goes on to say that a guy could get tossed in the slammer for even thinking about ripping it down. But those in need of a flesh fantasy needn't worry. 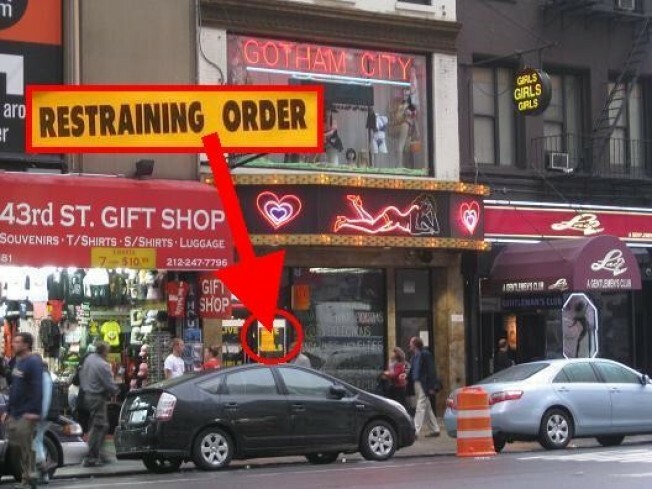 Gotham's proprietor has duct taped a helpful sign next to the official one, directing customers to the "sister store" a couple of blocks to the north at 781 Eighth Avenue (curious readers will find it near 48th, below the superfinger). And a holla to Richie Rich: if you're looking for a new special friend you might give that place a try.